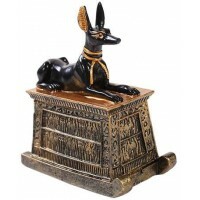 One of the most famous Egyptian statues ever found the bust of Queen Nefertiti tops this 4-inch high trinket box. Bronze resin trinket box is 4 inches tall with hand painted color detail and lift off lid. Item Number: UI-WU77105A4 | Approximate Size (Inches): 3.50 wide x 3.50 deep x 4.00 high | Approximate Shipping Weight: 1.50 lbs.